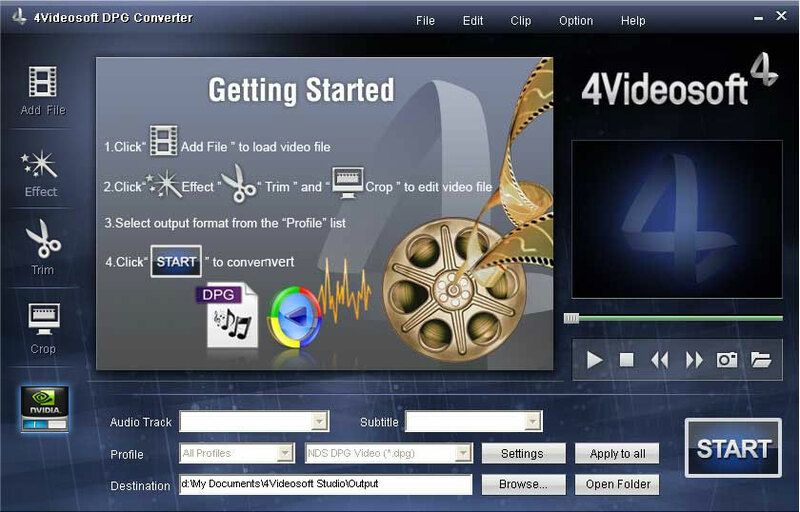 4Videosoft DPG Converter, the essential DPG movie converter for Nintendo DS fans, can convert any video like convert MPEG to DPG, convert AVI, MP4, 3GP, VOB, H.264/AVC, WMV, DivX, MOV, RM, ASF, HD video to DPG, DPG2, DPG3, DPG4 video, and convert WMA, WAV, M4A, AAC, etc audio to MP3/MP2 for Nintendo DS. Different from other DPG file converter, It can set output effect, trim clips, crop play region, preview the videos first and capture image. ...... one, add watermark, etc. Plus, 6X faster conversion speed with NVIDIA CUDA now. Convert video files with formats in AVI, MPEG, FLV, H.264/AVC, 3GP, VOB, DAT, WMV, MP4, DivX, MOV, RM, and ASF to play on Nintendo DS (supporting DPG/DPG2/DPG3/DPG4 format). More over, this DPG file Converter also outputs other pop formats like MP4, H.264, AVI. Besides converting any video to DPG, it is available to convert most video and popular audio like WMA/WAV/M4A/AAC/AC3/OGG, etc to MP3, MP2 and OGG played well on NDS. Qweas is providing links to 4Videosoft DPG Converter 5.0.10 as a courtesy, and makes no representations regarding 4Videosoft DPG Converter or any other applications or any information related thereto. Any questions, complaints or claims regarding this application 4Videosoft DPG Converter 5.0.10 must be directed to the appropriate software vendor. You may click the publisher link of 4Videosoft DPG Converter on the top of this page to get more details about the vendor.